This climb was supposed to have been led by Larry Ingalls. Unfortunately for us, Larry suffered a fatal fall three weeks ago, so this climb turned into a "this one's for you" endeavor. Nine of us started out from Fryingpan Creek trailhead at 3900' towards Summerland. The trail is wide and in good shape, but large parts are still covered in snow. After about four miles we crossed Fryingpan creek itself and broke away from the trail, instead heading for Meaney crest, where we had planned on spending the night, at around 7500'. We wound up hiking even higher, onto the lower, uncrevassed reaches of Fryingpan glacier, finding a suitable camping spot at 7900' around 3pm. Setting up camp and melting snow for water took until 8, and in that time we watched the weather deteriorate from a nice, sunny day to rain, then hail/snow, and finally a whiteout. Fortunately, the wind never got to be too bad. We awoke at midnight, and headed up the Fryingpan glacier a little after 1. We made good time to the notch separating Fryingpan glacier from Whitman glacier. The snow was solid, and because of the heavy snow year the crevasses were only starting to break up the surface. About half a mile after the notch, we headed straight up the Whitman glacier. The glacier is rather steep, so we used running belays. Unfortunately, the snow was light under the crust, so pickets had to be buried as deadmen to be effective, which took a lot of time and significantly slowed our progress. The glacier ended in a steep gully filled with loose rock at around 10500', above which the route followed a cliff band up a steep snowfield. Then one more rocky gully, and then the summit block. The weather was fantastic as we had clear visibility for a hundred miles or more. We were able to see from Mt. Hood to the south all the way to Mt. Baker in the north. 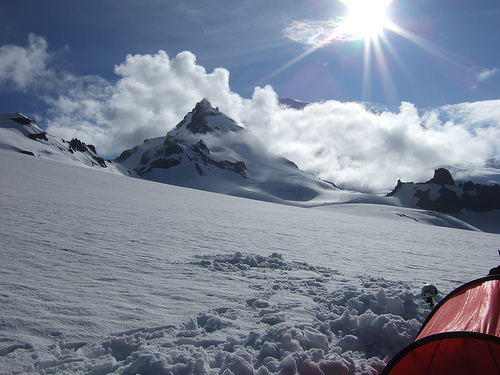 Rainier's Emmons glacier loomed just an arm reach away, dotted by rope teams making their summit bids. We spent half an hour on the summit, and then started back down. The sun had by then softened the Whitman glacier, and we plunge-stepped the whole way down, stopping to dig up the pickets we had placed on the way up. As we reached camp a little after noon, the weather started to take a turn for the worse again. Clouds which had kept their distance to the east now approached, and the wind picked up some. We packed up camp, and headed down towards Meaney Crest. We planned to descend via another route, but strayed too far to climber's right and dropped into a big bowl which ended in a broad, tall cliff band. We were able to descend a steep patch of snow on the very right of the bowl. About the same time, the rumblings of thunder started to be heard. We managed to get a short glissade in and then hoofed it down the trail back to the cars. The route heads for the notch between the Fryingpan and Whitman glaciers, and then straight up the Whitman, visible on the left side of the peak. The clouds swirling around the summit obscure the view of Mt. Rainier's Emmons glacier.